Patina is the latest creation from Mombacho. It was created by Mo Maali - the national sales manager for Mombacho. According to Maali: "Patina is is an oxidation process that, over time, produces a green film over bronze or copper". In the same spirit, our experiences in life shape our opinions, attitudes and beliefs. Just as those buildings underneath the patina retain their original character, we too as human beings will always be ourselves at our core. No matter what happens in life, always be true to yourself." 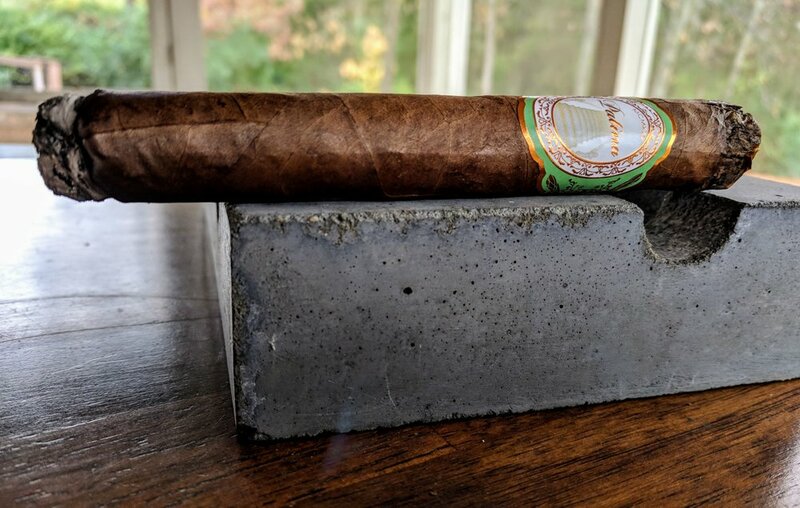 There's currently two Patina lines with four vitolas each: Habano and Connecticut. Patina's band is thoughtful and intentional without being hit-you-in-the-face obvious. The bronze and green are an obvious nod to the brand's namesake and concept - representing copper in it's new state and it's patina'd state. The sixteen steps at the band's center imitate the steps leading up to Mombacho's Casa Favalli factory. The band is simultaneously perfectly balanced but completely lacking something - it's just a little boring. While it sits as a beautiful contrast to the dark habano wrapper, it's forgettable and could use some additional contrast within the band itself. The Patina Habano is an attractive looking cigar. 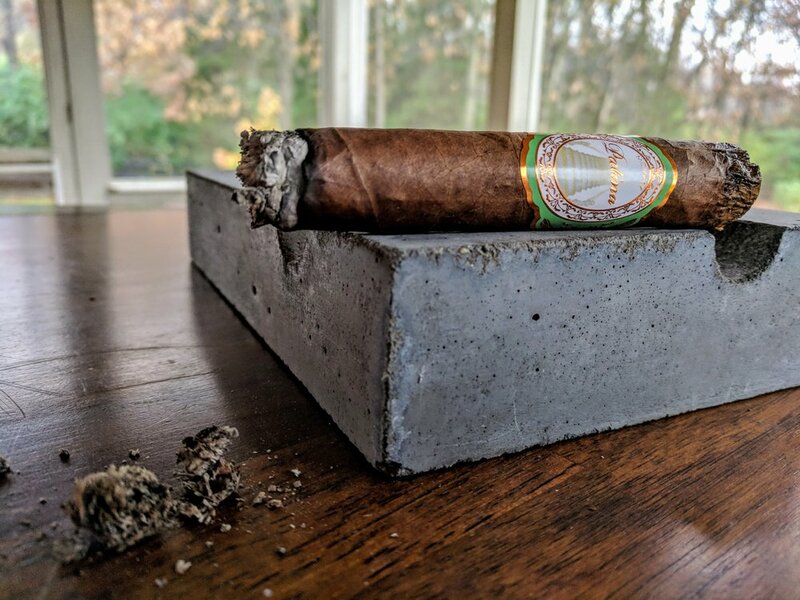 The Ecuadorian Habano wrapper is just beautifully applied - invisible seams and laying perfectly smooth. It's a rich, leathery brown color with a nice oily sheen to it. There are a decent amount of veins throughout the wrapper but they sit very flat and smooth - no hindrance to the aesthetic whatsoever. The toro vitola has a good weight to it. It feels dense and appropriate for the size. A light inspection yields a couple softer spots but it's nothing to be concerned about - just a slight variation to an overall firm cigar. The cap is well applied but otherwise unremarkable. The foot has a high amount of color variation to it that - on a pure color scale only - reminds me of pipe tobacco. Looks like a well-rolled cigar with no obvious concerns at either end. I am a little stuffed up with a cold but there is a pleasant sweetness to the aroma - a little bit of cocoa, leather and faint cinnamon/cloves. The cold draw is fairly tight and not all that flavorful. There is a little bit of cedar and light dried fruit sweetness - that's about it. 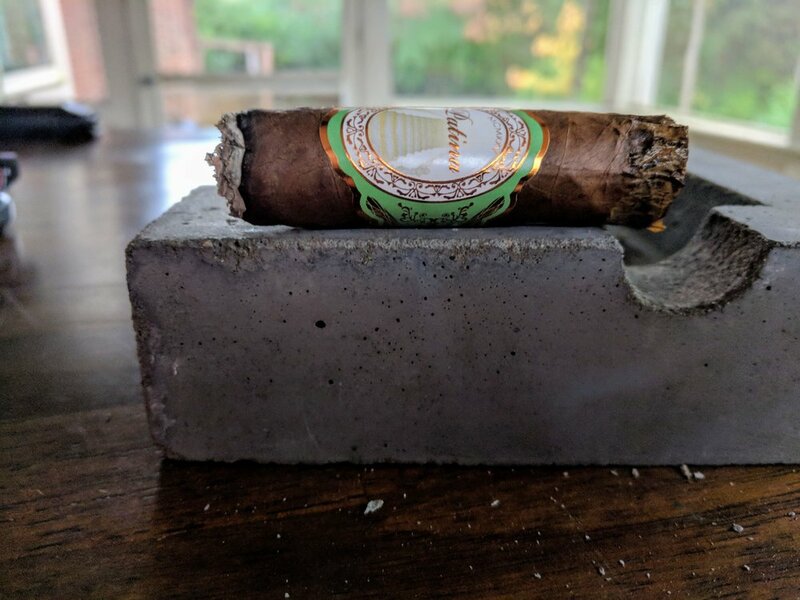 The Patina Habano lights up easily enough - a couple second hits of the flame were needed at one spot that didn't want to light at first but now that it's going, everything is burning evenly. The first few puffs bring a very small amount of pepper, some baking spice and sweet creaminess. The pepper subsides very fast and there is a fantastic smooth, creamy flavor building immediately. The tight draw continues but once the flame hit the foot, it's not quite as bad as I was expecting. There is still more of a 'milk shake consistency' to the draw but it's definitely acceptable. The burn is starting out well enough - some minor deviations but it's expected at this point. The first few layers of ash are a medium grey with a faint pink hue. It seems like a solid ash so far - here's hoping it continues to stack! The Patina Habano's smoke output is a bit skimpy to start and, honestly, very lacking. 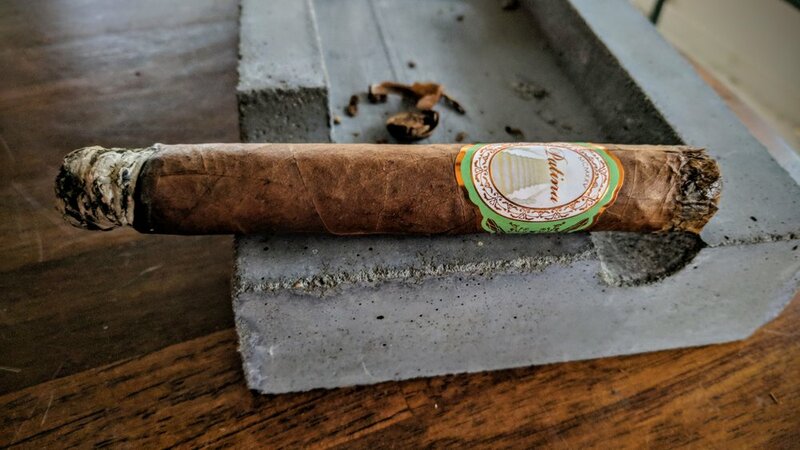 However, as it got going, the cigar kicked out a very steady stream of smoke while resting and some great voluminous white/light blue plumes. Also, for what it's worth, a very pleasant smelling cigar. The flavors into the first third continue to be fairly mellow - a nice medium to light body on the Patina Habano. The creaminess is complimented by a nice amount of vanilla upfront and just a very faint hint of cayenne pepper at the tail end. There is some wet, cedariness as well. The retrohale kicks out a little more spiciness but also some minor smoked nuttiness. The draw has improved significantly to be just about perfect for what I like - very happy to see after a rocky start. The burn line has some waviness to it but overall is burning closer to perfect than crooked. Unfortunately, the cigar went out already after resting for about thirty seconds. A quick relight and it has stayed lit since. It is a little tough to gauge the density of the ash since I needed to ash the cigar in order to relight. It did seem well-attached and dense so I have high hopes it will develop that way again. Also, the wrapper at the cap unraveled a bit so I removed it where necessary - sorry, for the unflattering photos. At about the midpoint of the Patina Habano, some cedar and spice really start to replace the vanilla creaminess. It's still subtle and not too in-your-face but the swap is noticeable. The spice, to me, is more along the lines of a mild black pepper and cinnamon. Interestingly enough, the retrohale has relaxed on the spice since the first third and now really calls to mind some vanilla and orange zest - really a delicious combo. The draw continues to be just right and the burn, while a little wavy, is following suit. The ash is holding up very well - a marbled black and grey with clear layers present. The final third truly is a culmination of the preceding thirds. There is a return of light cream and vanilla that merges with the orange, spice and cedar is a phenomenal way. The flavors are leaning a little more toward the spicy side than the sweeter side. There's also some leather and smokiness playing a minor role. It's very interesting to experience and something somewhat unique to the Patina Habano (at least for me, to this point). There is a great complexity to the profile to finish up. The draw has been consistent since opening up at the onset of the first third - nice and open throughout the smoking experience. Like the draw, the burn has been about the same throughout. It has never required any touch-ups to correct the waviness but there were a couple relights needed at a couple points. 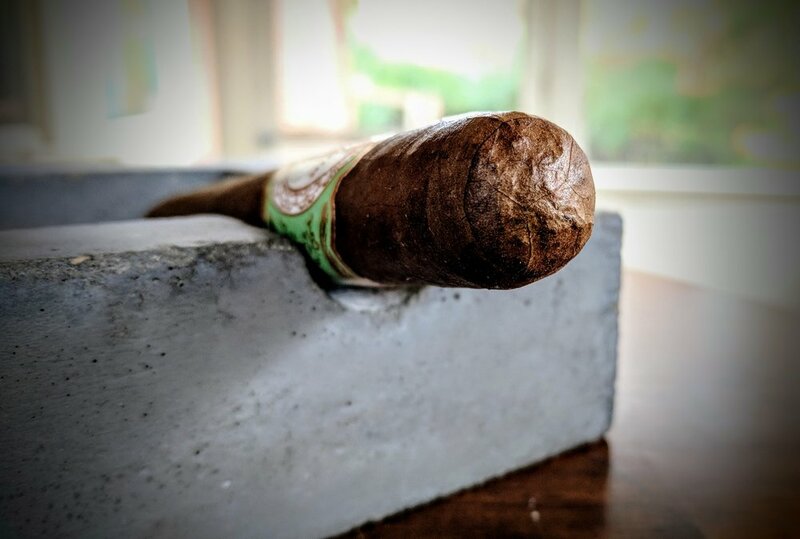 The flavor progression has been really interesting on Patina's Habano. The toro continually introduces and fades out new flavors only to have them all come back and blend seamlessly for the final third. Really a fantastic experience. All that said, I wish the flavors, especially the cream or sweeter notes, would have punched a little harder. When spice was involved, I had no issues distinguishing the associated flavors however at the creamy portions, it was a little more faint and weaker. The Habano wants to burn slowly ... but then goes out. So that is clearly a dilemma. Relights aside, the burn line was pretty good throughout - not razor sharp but never needing much attention to correct the burn. 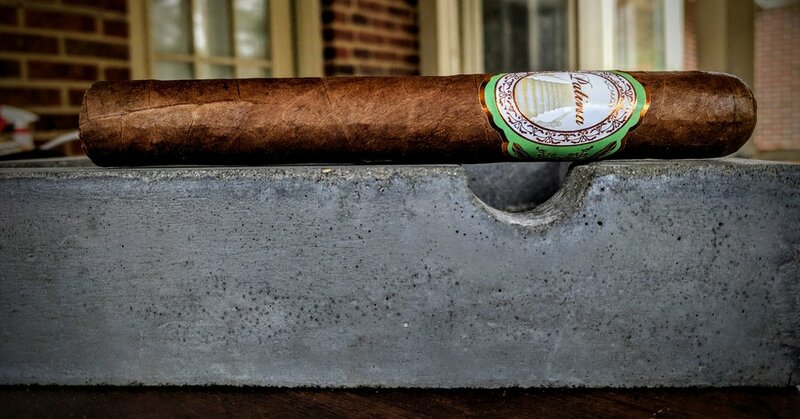 Patina's Habano blend was my introduction to the brand and it certainly did not fall short. The toro started flavorful enough and always melded together to create a complex and perfectly balanced cigar. It had some expected cedar and spice but the cream, vanilla and orange zest were a welcome addition and really shined at the end. For the price, I feel like the Patina Habano really delivers and has earned my recommendation. I'm looking forward to seeing what the other blends and vitolas have to offer! It looks like most reviewers were pretty fond of the Patina Habano in the couple vitolas I read reviews for. They averaged out to about a 9.1 which is a solid point below my 8.1. I will need to take a second pass shortly to make sure I didn't just get a dud. It was a solid smoke for sure but I'd have a tough time rating it a 9.4.